Long term fitness goal:I want to continue to improve my form,increase my flexibility, continue to improve my strength and definitely improve my form in lifting. 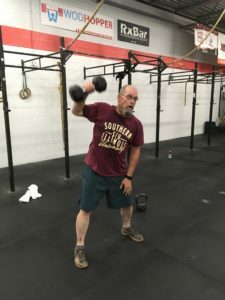 How has Crossfit helped you outside of the gym: Outside of feeling really good and having more energy; it really helped me get ready for my first Spartan race (late June).It was something I wanted to experience and I really had a lot of fun doing it. Would you design a Work out of the day? :I’ll give it a try. 8. Favorite Part of Kilter:I think what I like most is the community aspect of it and of course the coaches.There is so much variety in the workouts, which are fun and challenging, and all the members push each other forward.All of the coaches have been very helpful and teach the techniques very well.Everyone is there help and I have always had fun with every workout… it is great environment. 9. Advice for a new member?Set your goals on what you want to accomplish and stick with the workouts.You will have fun and it is a great community to be a part of.